We have entered an era of treatment accountability. 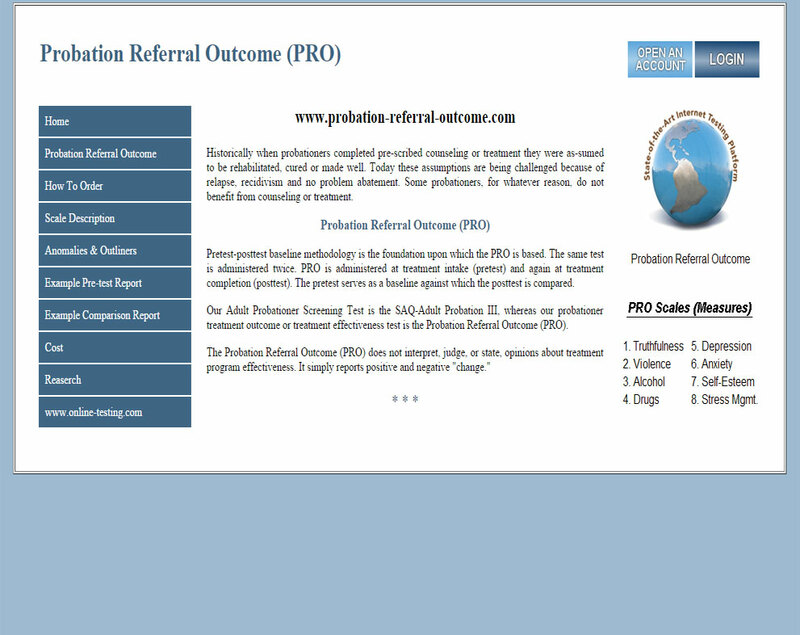 Historically, it was enough to know the client (patient, offender or victim) completed their assigned, treatment protocol. It was assumed, when treatment (classes, meetings, counseling, or psychotherapy) was completed, the client was better. These assumptions are being challenged. Many people (courts, probation departments, evaluators, referral agencies, treatment staff, victims, and others), including the patients and their families, want to know if treatment was effective. And, insurance carriers, managed care administrations, state and county overseers, program managers, regulators, oversight committees, and taxpayers also want to know if treatment was effective. The Pre-Post Inventory helps answer the question, "Was treatment effective?" 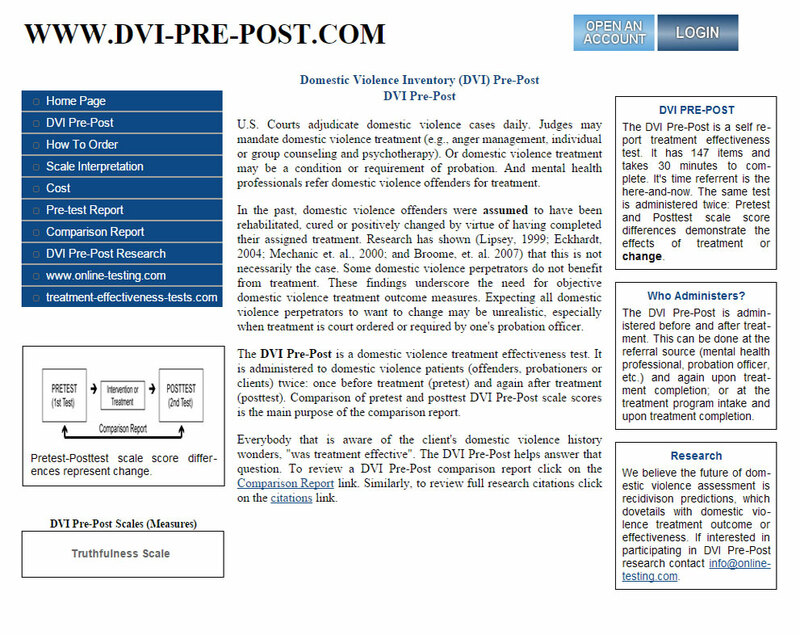 Its eight (8) scale, pre-post comparisons reflect client, patient, offender, or victim change, during treatment. The Pre-Post Inventory is a treatment effectiveness test. The Pre-Post Inventory is used, when you want to know if counseling or treatment was successful. The same test is administered twice. The pre-test (or 1st test) serves as a baseline for post-test comparison. 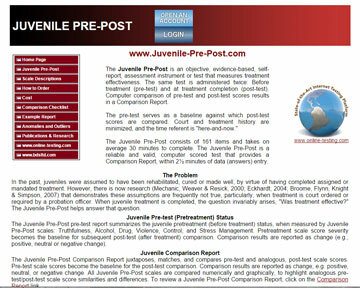 Upon post-test, the computer compares pre-test and post-test scale scores, and generates a "Comparison Report." The Pre-Post Inventory is only offered on the www.online-testing.com website. This means that the Pre-Post Inventory is available 24/7. Advantages include convenience, accessibility, and affordability. The Pre-test/post-test paradigm involves testing, before and after treatment, with pre-post differences attributed to the intervening treatment. One test is administered twice: Once before treatment and, then, again, upon treatment completion. The pre-test serves as the baseline for post-test comparison.